On the occasion of the traditional worker’s holiday, May 1, the Connecticut Digital Newspaper Project would like to introduce a rare state labor title that we are soon to digitize. 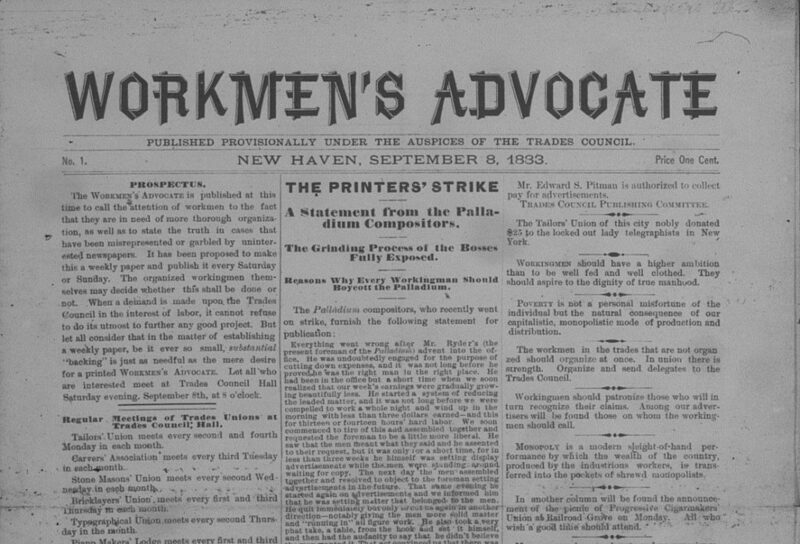 On September 8, 1883, the New Haven Connecticut Trades Council published, for the price of one cent, the first issue of the Workmen’s Advocate. Its immediate aim was to publicize the demands of the compositors then on strike at the New Haven Daily Palladium and to urge a boycott of that newspaper. The new members of the Typographical Union at the Palladium struck to stop cost-cutting measures that had lowered their pay. The city’s local trades unions, including the tailors, cleavers, stone masons, bricklayers, piano makers, cigar makers, wood carvers, and granite cutters, were the object of an appeal for funds to continue weekly publication of the new paper, but only one other issue came out that year. According to a history found on the editorial page, eight issues of the Workmen’s Advocate were published in 1884 to support a strike against the New Haven Morning News. Later, on October 4, 1885, the Workmen’s Advocate announced that it would henceforth appear as a regular weekly publication. According to Editor J. Fred Busche, the Workmen’s Advocate was joining the Hartford Examiner and the Naugatuck Agitator as one of three independent labor newspapers in Connecticut. Busche also declared that the Workmen’s Advocate intended to counteract “the evil influences of the corrupt capitalist press by printing the truth and placing before the working people food for thought and reflection upon their industrial, social and political conditions, to the end that they emancipate themselves from wage slavery and landlordism.” On September 12, 1886, the Advocate carried a story about New Haven’s “Labor Holiday” and “first parade,” which culminated in a picnic at Savin Rock. News of the many strands within New Haven’s labor movement, including the Knights of Labor, the Greenback Labor Party, and various united state labor electoral formations, appeared on the page alongside appeals for the boycott of New Haven newspapers that refused to hire members of the Typographical Union. In July 1886, the Advocate was tried on conspiracy charges after calling for a boycott of the Morning Journal and Courier. On November 21, 1886, the Workmen’s Advocate declared itself “the official journal of the Socialistic Labor Party of North America.” Becoming the English-language newspaper of a national organization whose congresses were still recorded primarily in German, the Advocate represented the hope that this wing of the socialist movement would gain increasing numbers of non-immigrant “American” members. National coverage included tours of European luminaries such as Karl Liebknecht, Edward Aveling, and Eleanor Marx that passed through Connecticut. In March of 1891, the Socialistic Labor Party replaced the Workmen’s Advocate with a new and larger weekly newspaper called The People based in New York. The last editor of the Workmen’s Advocate, Lucien Sanial, contributed to The People until 1892, when he retired. Look for the Workmen’s Advocate late this year in Chronicling America at https://chroniclingamerica.loc.gov. Meanwhile, search in the newspapers we already have online for proper names, phrases, or keywords found in this blog.